The Tony Stalboerger farm was recently honored at the Stearns County Fair for reaching the century farm milestone. The Stalboerger farm is located on the north shore of Lake Henry. It was homesteaded by Ernest Miller in 1873 and has been in the Hugo Lieser family since 1898. Peter Lieser purchased the farm for $6,000. He built a barn, tool shed, garage and granary. In 1939, Hugo and Loretta Lieser purchased the farm from Hugo’s dad. Hugo said he lived on the farm 62 years. In 1948, Hugo tore down the barn which was situated close to the lake and used the salvaged lumber to build another barn to the north. Stalboergers took over the farm from Pat’s dad, Hugo, in 1974. “We started with two or three milk cows and bought our first 10 calves from my parents,” Tony said. Today they have a 56-cow herd of Holsteins. Stalboerger built a larger barn in 1977, even further away from the lake. “With changing regulations, we couldn’t have anything draining from the farm feedlot into the lake,” Stalboeger said. Hugo said in the early days, farmers didn’t erect farm buildings on farmable land, they built closer to the lake where the land wasn’t fit for farming. Hugo recalls Lake Henry being dry about three times where farmers could pasture their cattle on the lake. “In 1934 the Lake Henry area was so dry, we hauled our dry dairy cows to Perham to pasture where there was water and food. There was nothing to feed them around here,” Hugo said. Today the farm contains about 177.33 acres. Twenty-three acres (the lake) is considered government land where the DNR raises fingerlings. When the Liesers retired from the farm, they moved into Peter Lieser’s home in Lake Henry and shared the house with Hugo’s sister, Agnes, for 12 years. Hugo and Loretta will celebrate their 60th anniversary on Sept. 6. The Lieser house burned in November 1967 and a new house was erected in 1969. Since then, the Stalboergers have enlarged the house several times. 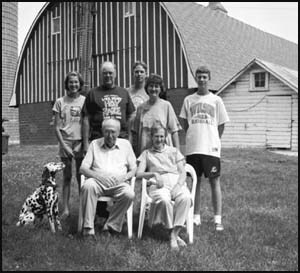 The Stalboerger children are the fourth generation on the farm.